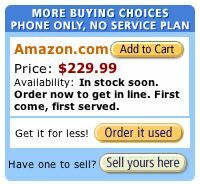 The Sidekick II sells from T-Mobile for as low as $249.99 ($299.99 minus a $50 web-only rebate), but Amazon.com is selling it for $229 without contract. While marked as "coming soon", the price to purchase the phone only is a stunning $229 (see photo after jump to see where to purchase just the phone). T-Mobile will not sell you a Sidekick without service which makes this deal all the better. If you want service the Sidekick II will cost you $199 from Amazon.